There is one thing that we all have in common, and it will either be used for the good or the detriment of society. Influence is a power that we knowingly or unknowingly exert upon the life of others. 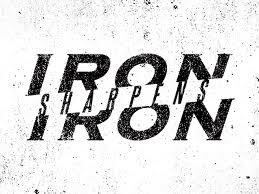 Solomon spoke of the power of influence in Proverbs 27:17: “As iron sharpens iron, so one man sharpens another.” Since I used to make knives, I know that the way to sharpen iron is to rub it against another piece of steel or some other object. When sharpening a knife it is important to use the right amount of pressure, to keep the grind line straight, and to align it to the correct degree. If too much pressure is applied, the knife can be damaged; if the grind line is not straight, the knife will not cut smoothly; and, if the knife is held at the wrong degree, it will either become dull or easily lose its sharp edge. We need to think about the way we speak to a friend, a family, or a co-worker. What do they hear in our words? Are they hearing words that build them up or that tear them down? •	Stir one another on to love and good deeds (Hebrews 10:24-25). Does the light of your influence blind the eyes of others, or is it a lamp to their feet and a light to their path (Ps 119:105)?